Scare the trick out of them with the WowLights Bust! The WowLights Bust has been specially designed to receive WowLights Bust Video Sequences. We offer several song and theme based video projections with light synchronization for use with the bust. 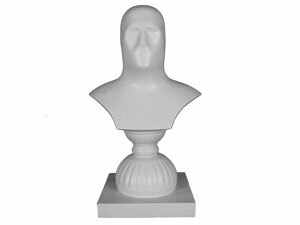 The Bust measures at just over 26in tall. Projector & Video Sequence, Computer, Light-O-Rama Controller, Light-O-Rama Software (Advanced Version), USB485 Adapter, lights, and extension cords are required to control lights with the bust. Click here for the complete package. Already have a Light-O-Rama setup and want to add the bust? Click here.